Ace Shepherd - shepherd,geek,car guy...: Happy Birthday Thom !!! Well, how about this, my first blog. 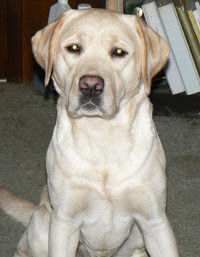 Just a quick moment to wish my yellow lab boy, Thom, a happy birthday :) Three years old already !!! It is amazing how much of an impact they can make on your life. When Thom was a pup and my chocolate lab, Penny, was still alive, he was just one of the pack. Within days after Penny's passing to the Rainbow Bridge, Thom stepped into the hole she left and took over doing all of the things that she used to do. Happy Birthday Big Man !! !